Over $360,000 raised for Charity! Drum roll please!!!! Brides for a Cause is pleased to announce that it has raised over $360,000 for our partner charity, Wish Upon A Wedding, a nonprofit organization granting weddings and vow renewals for couples facing serious illness or a life-altering circumstance. Since we started in 2012, we have sent the charity over $360,000 to help fulfill their mission of granting weddings for couples who deserve them! 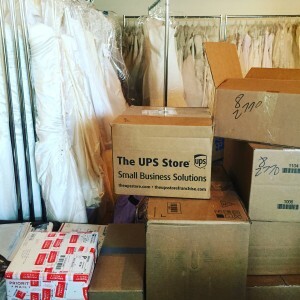 We may be only a full-time staff of 3, but we have received help from thousands of supporters, donors, brides, volunteers, colleagues, freelancers and strangers from across the country giving us the support, reminders and courage to continue recycling wedding dresses, knowing in the end we’re helping others! We hope after reading this you may be inclined to make a difference in the world like we have! Most days we stand in awe of all of the dresses that arrive on our doorstep daily. Past brides are trusting us with their wedding dresses to resell while bridal stores, manufacturers and designers are wanting to “send” their samples to a place that will appreciate them – and for that desire and generosity, we are forever thankful! Thank you for letting us be the “middle man” of connecting brides with other brides through their wedding dresses, so they can be worn again!